Open houses are the life blood of a listing Agent. What better way to try and sell a home than giving access to it during an open house. 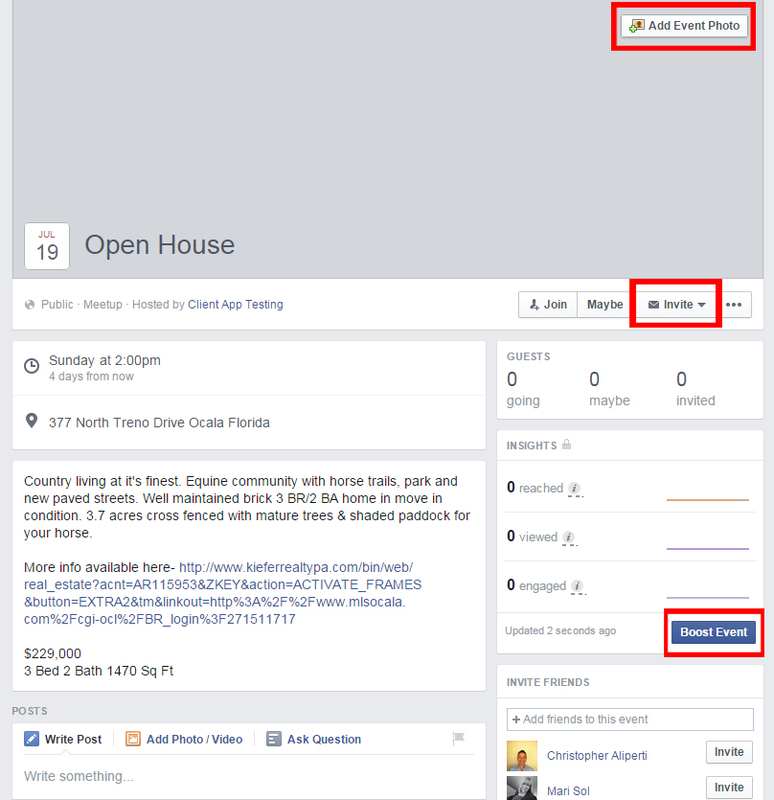 For this reason we decided that we would put together a blog entry on How to Advertise an Open House on Facebook. Without any more delay, let’s get started. While on your business page. Click on the “Offer, Event +” button then choose the Event option. If you already have the new Facebook “Write Something” box, you may have to click the “Event” icon instead. A small box will appear prompting you to fill out all the pertinent information about the event such as the Name of the Event, Event Details, Where it will be taking place, When and what Category (Just use the “Meet Up” option for this as there is no option related to real estate). You can add more information like photos later. Once all that is entered click the “Create” button. 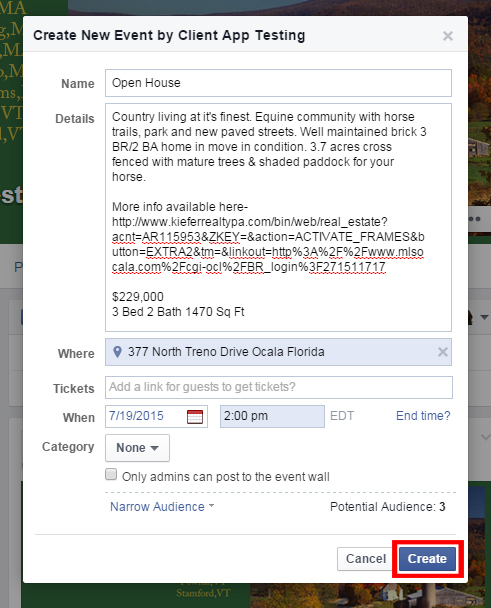 Now that the Event is created, you will be presented with the actual Event page. This page is what users will see when they click on the event itself. You can now: A) Add an Event Photo (which can simply be a picture of the home) B) Invite personal connections C) “Boost” or create an ad for the event. Besides adding a photo and inviting personal connections or colleagues, your Open House event is done! However, it is recommended that you advertise your post so can have a better turn out which we will go over in the next step. *You do not need to create an Ad, but the option is always there to boost your audience. To create an ad, click on the “Boost Event” button and you will be presented with the below pop up. On the left side you will see an Ad Preview which is exactly how the Ad will look on a Desktop computer and Mobile device to the people you advertise to. On the right you will see the Audience, Budget and Duration, as well as the Payment method. We will be focusing on the Audience section, as people usually have the most questions about this section. If creating a new audience, be sure to properly name it something that is easy to remember such as My Default Audience. In the future, you can create multiple audiences to use but we will only be using one for the moment. You can now enter specific cities you would like to include as well as demographic information. This helps Facebook serve the Ad only to people who fit your description. After you have created your ideal audience be sure to “save” and move on to the next step. Now that you have determined your Audience you can choose how much you would like to spend on your ad as well as how long you would like to the ad to run. 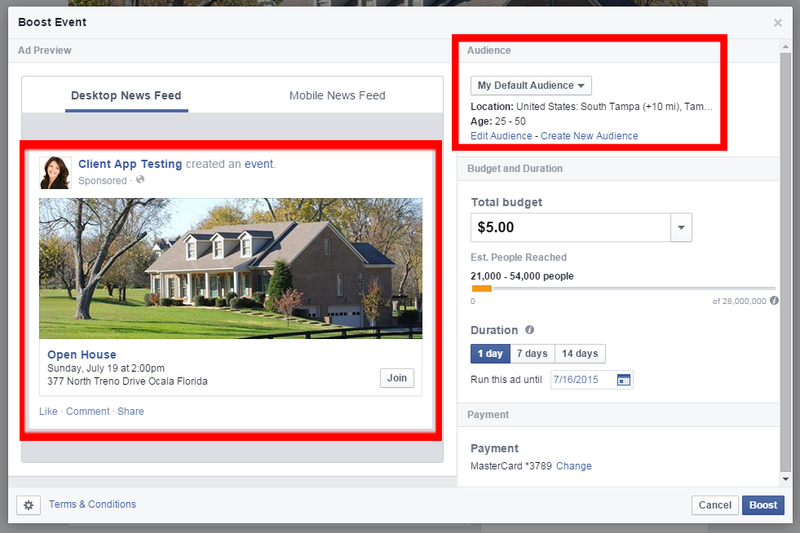 A moderate $10-$25 budget can result in a surprisingly large potential reach (amount of people who see your ad) depending on how focused your audience is. 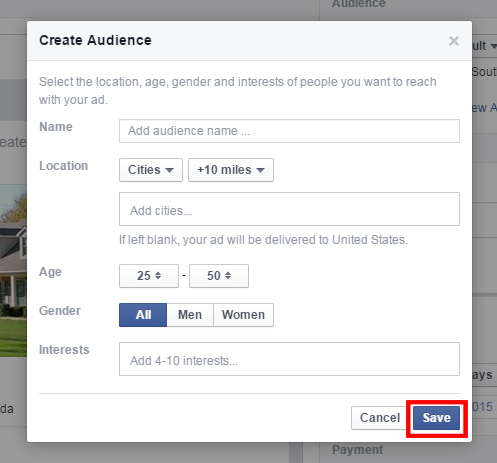 For duration you can choose one of the options – 1 day/ 7 days / 14 days OR you can choose the “Run this ad until”. It is recommended to use the latter of the two which will start the ad the day that you create it and give you control as to when it ends. 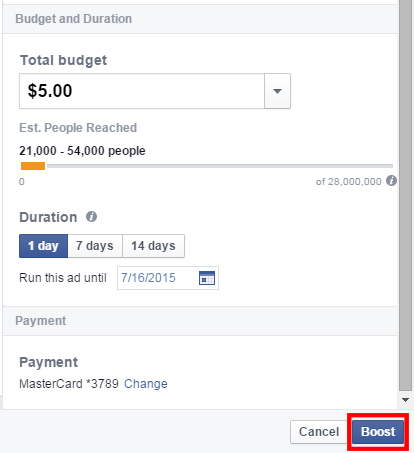 Once you have chosen the Budget and Duration and entered your Payment method, you can click Boost to finalize the Advertisement.